A senior prank to foam the halls of a Christian high school is thwarted by local police at around 4:00 a.m. Is their action an illegal entry or an innocent prank? After graduating, many graduates descend upon the beaches to celebrate. For many, the festivity includes the tradition of alcohol and sexual promiscuity. Sitting in the pews listening to the pastor preach can be very trying if you have a burbling, wiggling ten-month-old on your lap and a three-year-old intent on coloring the hymnal beside you. You're in a quandary. 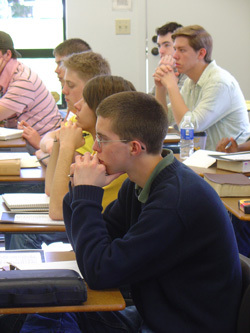 You do not want to disturb those in neighboring pews, but you do want your children to learn to participate in worship. What's a parent to do?